I’ve been involved with the Entomological Society of Canada for a long time. It’s a wonderful community of Canadian entomologists sharing an interest and enthusiasm for arthropods. The ESC’s activities are mostly centered around its annual conference, its range of publications, and it offers a suite of awards and scholarships. The society’s website also hosts career opportunities, photo contests, and a range of other rich and varied entomological content. The latest, big news for the society is that on 1 June, the ESC officially launched its own blog. This blog was the brainchild of a few members of the society, and two great Canadian entomology bloggers, Crystal Ernst and Morgan Jackson, are the administrators of the blog. 1) Visibility: it’s a tough time for scientific societies – funding is tight, and for a lot of people, the value of memberships to societies may seem less important than it once was. Therefore, increased visibility though an on-line presence is important. A static website is essential, but a blog has a fluidity and dynamic presence that is hard to match with a website. An active blog with well-written and interesting content will do a lot to increase a society’s visibility. The visibility from an active blog is also global in its reach. 2) Opportunities to contribute: the ESC blog will have dozens of contributors – means anybody with an interest in entomology (regardless of their profession and educational background) has an opportunity to write something for a broader audience. Blog posts are often easier to write, they are shorter than research papers, and the content need not be vetted through a peer-review process. It’s a forum for creative ideas, stories, photographs, and fun facts about insects. The blog already has a couple of nice examples to illustrate this point. 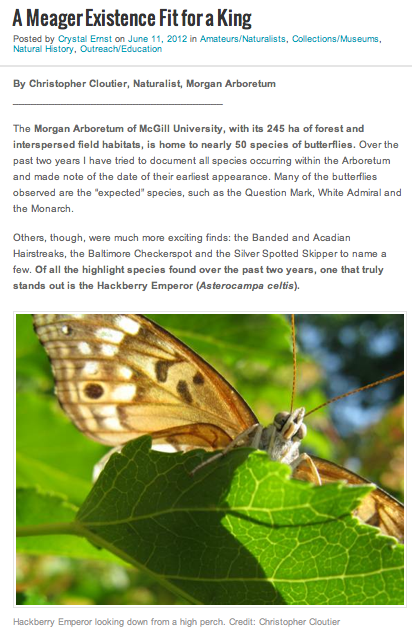 For example, Chris Cloutier, a naturalist at the Morgan Arboretum on the Island of Montreal, just wrote a lovely post about the Hackberry Emperor. Chris is an example of a different kind of entomologist – he’s not a research scientist, nor is his primary profession Entomology. However, he does outreach, has a wealth of expertise and talent, and he has a lot to offer the entomological community. These kind of opportunities create an environment of inclusion for a society – members have a voice and can share their ideas and expertise. Non-members can also contribute and recognize that there is a strong community associated with the ESC (…and perhaps some of the non-members will see the value of the society and join). 3) Economics: more than ever before, scientific societies are struggling to maintain members, and balance their books. A blog is a cheap and effective way to promote their science to the world and the cost can be as little as a domain name. I can think of no other method by which a society can promote itself at this cost point. You could even argue that the time for static websites may be coming to a close since they are costly to host, require people with specific technical skills, and require a lot of back-end support. The good blog sites can be administered by people with relatively few of these skills (I’m proof of that!!). 4) Marketing and branding: a high quality blog helps a society get its brand to a broad audience, and helps to market the society to the world. The ESC has a long and wonderful history, but its main audience over the years has mostly been academics, research scientists, and students of entomology. The ESC brand has excellence and quality behind it and that kind of brand should be shared, expanded, and through this process, the society will hopefully gain positive exposure and more members. 5) Communication: At the end of the day, knowledge is something to be shared. Scientific communication is a fast-changing field and one that is making all of us reconsider how we talk and write about our interests. I think we all have a responsibility to do outreach. There is so much mis-information out on the Internet, and people with specialized and well-honed skills must be heard and must have a means to share accurate information in a clear and effective manner – e.g., a society blog. I also think many entomologist are perfectly positioned to do effective outreach (I’ve written about this before). Part of the ESC’s mandate is dissemination of knowledge about insects and social media is a key piece of any communication strategy. What do you think? Can you think of other reasons why scientific societies need to embrace social media? Please share your ideas! I will finish with a stronger statement: scientific societies are perfectly positioned to have the BEST blogs on the Internet. A scientific society is a community, a community with history, and a community built on high level of expertise. A scientific society also provides a structure and framework for bringing together high quality knowledge about a particular topic. A blog can be amazingly strong with this kind of support. A society is also about people and these people work tirelessly behind the scenes to facilitate the dissemination of high quality content. These people, structured in committees, and with oversight from an executive committee, can provide tangible support that will help to keep a blog from becoming unidimensional. The ESC’s blog administrators (Crystal and Morgan) know how to keep the content of high quality, and know how to put all the pieces together – and they know they can do this because they have an entire community behind them. The society is committed to supporting the blog and for that reason, there is reason to be optimistic about its long-term success. Please follow the blog! “At the end of the day, knowledge is something to be shared” I’m on receiving end of specialised knowledge and I can only agree with your text. Scientific societies can have the great blogs and I think we are all waiting for this to happen, in all fields. Have a positive impact on society with current social medias and get support on return. Thanks for the comment Roger. Glad to hear there is an interest from you and hopefully society blogs can fill an important need. Scientific societies could have perfect blog, but this will not occur since most scientists are avtually not interested at all in science blog neither in writing texts without impact factors, h-index,… Simply they could but they don’t! Mauro – yes, that is a challenge – to get academics/researchers to fully buy into this kind of outreach will require a culture shift. However, a society’s blog will allow for contributions from beyond these types of career paths, and will a large pool of potential contributors, and individual scientist need not spend much time or energy on a contribution every now and then. A really interesting piece about why scientific societies should have a blog. I can’t help but wonder how many nature societies, big or small, don’t do this. What does it mean to “do science”? Categories Select Category Academia Arachnids Arthropod research Be Curious Expiscor Graduate students Guest Posts Lab Publications Laboratory News Methods in science Must-read Research Papers Natural History Outreach Plain-language summary Potpourri Spiderday Spiders Teaching Uncategorized Where are they now? Academia Arachnids Arthropod research Be Curious Expiscor Graduate students Guest Posts Laboratory News Lab Publications Methods in science Must-read Research Papers Natural History Outreach Plain-language summary Potpourri Spiderday Spiders Teaching Uncategorized Where are they now?